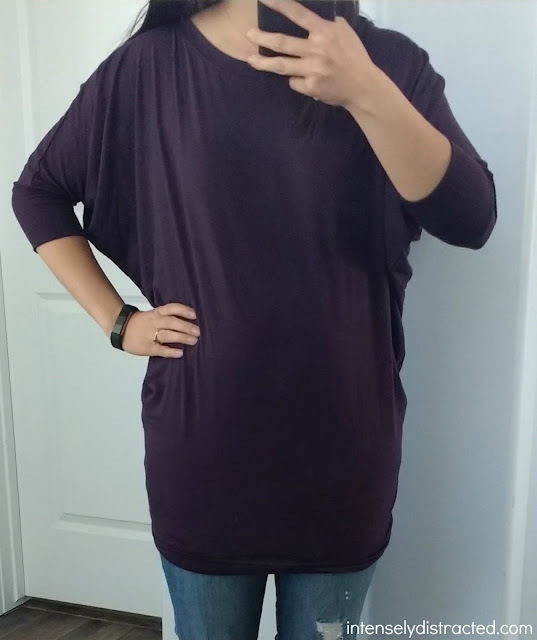 I was super disappointed after my last Stitch Fix and I wasn't sure I'd try it again. It was a solid box but it didn't refect my personal style very well and I felt like my stylist didn't do a great job listening to what I wanted. I was starting to lose faith but decided to give it one more try. Even though I was disappointed, I was still super excited to get this month's box and almost spoiled the surprise by taking a look at the contents online beforehand. I resisted temptation and I'm so happy I did. This box ended up being one of my favorite ones yet. 1) Fill out your Style Profile and schedule your first Fix. 3) Get your Fix in the mail and decide what to keep and what to send back in the prepaid envelope. 4) Make notes on what you loved/hated in the Fix so your stylist knows for your next Fix. 5) Use the $20 stylist fee toward anything in the box. Keep it all and get 25% off everything. For this month's box, I made sure I updated my Style Profile to give a very detailed note about what I wanted to see. I made sure to include that I was looking for versatile, staple pieces that could dress up my simple wardrobe to something more sophisticated without much effort. For the first time, I also included a bunch of things I didn't need or want (olive/military jackets, black jeans/leggings, dry clean only) along with things I was in need or want of (drape jacket, cropped/distressed jeans, skirts to wear with graphic tees). Normally I enjoy letting the stylist come up with items, but I didn't want to take any chances this time around. 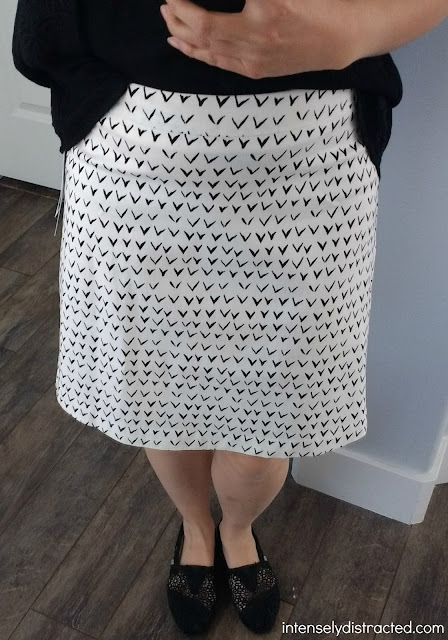 I was very happy to see that my stylist included a skirt this time. I really like the neutral palette and could definitely see myself wearing this with my graphic tees. When I first tried it on, it took me a couple of takes searching for a zipper before I realized that the fabric was stretchy. It fit easily over my hips and it hits right above my knee. It's super comfy and I like that the print is different without being too crazy. 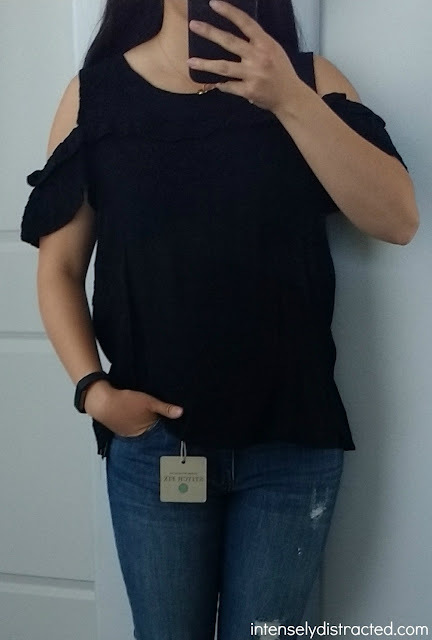 The cold shoulder blouse trend is one that I'm really warming to and I like how this one looks and fits. I'm a neutrals girl so I love the black with the subtle floral details. It's hard to see in the photos, but the material is also flowy which is great for the warm weather. This is the only non-neutral colored item in my Stitch Fix and I love it! It's a great dark purple that I think would be great for transitioning between seasons. I like the material and fit although all that extra fabric makes it super awkward for me to style and a little outside my personal style. I've been looking for the perfect pair of cropped, distressed jeans and I think these fit the bill. I wasn't a huge fan of the huge cuff at first but I actually didn't mind it after trying them on. They fit great and would be perfect to wear just about anywhere. 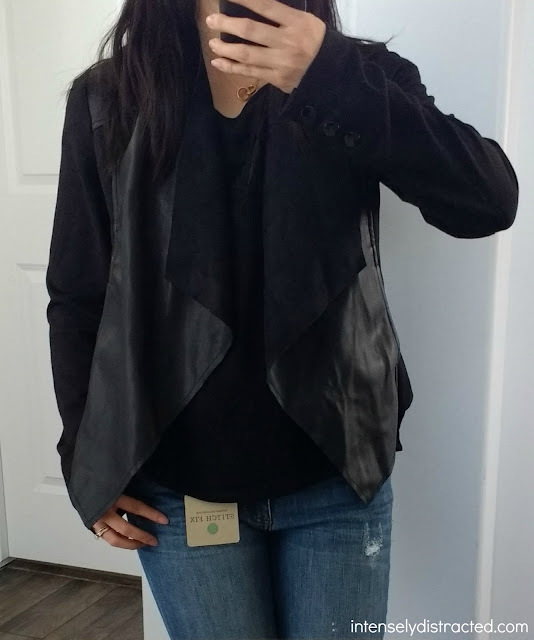 This jacket is my favorite from this Stitch Fix. I specifically asked for a drape jacket and this one is exactly what I've been looking for. The texture of the mixed fabrics makes it feel very lux, it fits my style perfectly, and I love that it's machine washable. The fit isn't ideal though because the sleeves are a bit too wide and super long. Final Thoughts: I really loved this box and was going back and forth between getting the entire box, only getting the black top, or exchanging the black jacket for a smaller size. With being very budget conscious, it's really hard to decide. 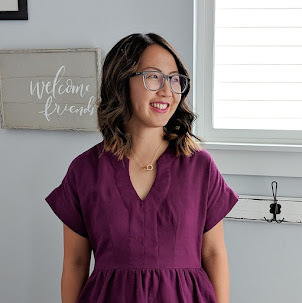 I know that I'll definitely try the cold shoulder top trend now because of Stitch Fix and I definitely need a drape jacket in my life so I will be on the lookout for these styles in the future no matter what I decide. What do you think? Which one would you choose? If you're interested in trying out Stitch Fix, I'd appreciate it if you clicked through my referral link to fill out your Style Profile. Even if you don't sign up now, the Style Profile is a great way to learn more about your style. Thank you! 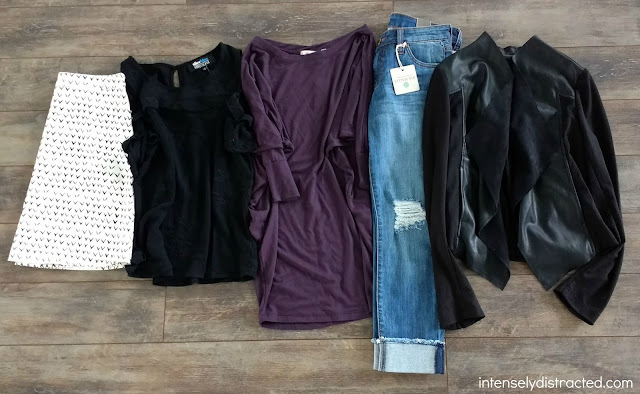 For more details on Stitch Fix, check out my first review here. 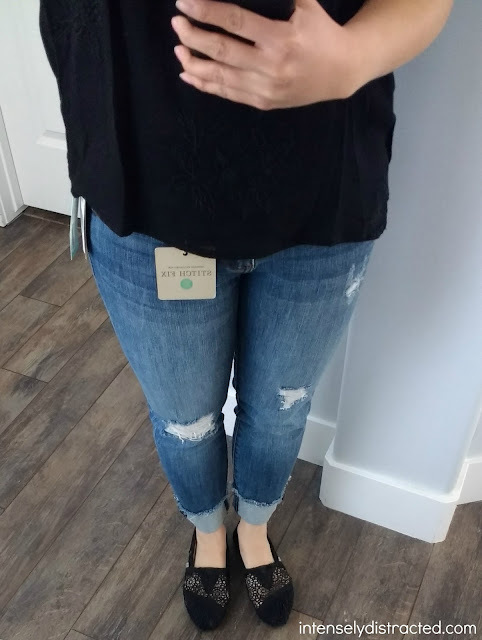 For more Stitch Fix reviews, look here.